This page covers the author of The Lost Honor of Katharina Blum. For other authors named Heinrich Böll, see the disambiguation page. Oakland- The Seated Diesels discuss "The Lost Honor of Katharina Blum"
Diesel, A Bookstore in Oakland welcomes The Seated Diesels back to the store to discuss The Lost Honor of Katharina Blum: Or Where Violence Develops and Where It Can Lead by Heinrich Boll on Tuesday, October 28th at 7:30 pm. In an era in which journalists will stop at nothing to break a story, Heinrich Boll's, The Lost Honor of Katharina Blum, has taken on heightened relevance. A young woman's association with a hunted man makes her the target of a journalist determined to grab headlines by portraying her as an evil woman. As the attacks on her escalate and she becomes the victim of anonymous threats, Katharina sees only one way out of her nightmare. Turning the mystery genre on its head, the novel begins with the confession of a crime, drawing the reader into a web of sensationalism, character assassination, and the unavoidable eruption of violence. 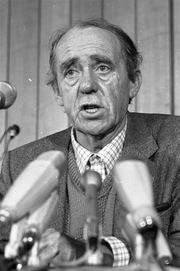 Heinrich Böll's book The Fishing Lesson is currently available from LibraryThing Early Reviewers.